Designed for the travel tastemaker, this carry-on spinner case from our sleek Aileron collection delivers the ultimate in durability, functionality and style. 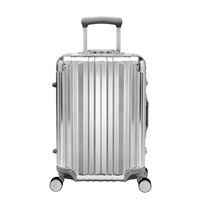 This elegant aluminum case is equipped with premium dual spinner wheels and a retractable handle with soft grip for superior comfort and maneuverability at every step of your journey.. Looking for a specific Ricardo Beverly Hills Aileron Case? Please don't hesitate to ask and we will find it for you!